Applicants must meet the following criteria to be eligible for the Creative Talent Award. Applicants are required to follow the steps below to ensure that the application is successful. 1. Open to students of all nationalities in public, private and international schools in Malaysia. 2. Scholarships are applicable to all first-time applicants for 2017 intakes only. 3. To apply, applicants must submit a certified true copy of their latest results. 4. 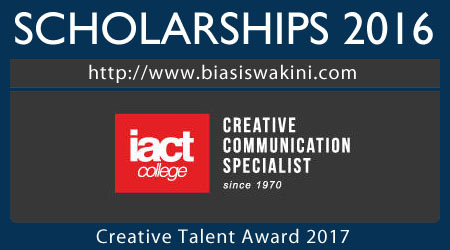 To claim the scholarship or award disbursement, applicants must complete the registration process, and meet IACT College’s minimum entry requirements for the respective programme. 5. The conditional scholarship offer is not a guarantee of funds. Scholarships and awards will be granted to qualified applicants based on fund availability, and successful and timely acceptance into our programme. 6. Recipients who applied with their latest results must submit a certified true copy of their actual results within ten (10) working days of the official release of results. Recipients who do not meet the minimum requirement in their actual results are required to refund the scholarship amount disbursed. 7. Quantum deduction is based on tuition fee ONLY. 8. Subject to fund availability and management discretion, recipients who applied with their latest results are eligible to receive a scholarship or award upgrade based on their actual results. In the event of an upgraded scholarship or award, the incremental amount will be offset against subsequent semesters’ fees. 9. Scholarships granted are neither transferrable nor exchangeable for cash. 10. Recipients must maintain a minimum CGPA set by IACT College at the end of each academic semester in order to maintain the scholarship. Recipients who do not meet the minimum CGPA are required to refund the scholarship amount disbursed. 11. Students are entitled to only ONE scholarship / award / waiver / bursary / other forms of financial sponsorship at any one time, including sponsorship from other institutions or bodies. The award with the highest quantum will automatically apply. activities for the purpose of promoting the institution. Recipients who fail to comply with all the terms and conditions may be required to refund the amount disbursed to him/her by IACT College. 13. Recipients will be required to sign an agreement accepting the terms and conditions of the scholarship or award. Recipients who fail to comply with all the terms and conditions may be required to refund the amount disbursed to him/her by IACT College. 14. Recipients are required to complete their studies with IACT College. Should a recipient drop out before the end of the programme, he/she is required to refund the amount disbursed to him/her by IACT College. 15. All scholarship recipients are required to undergo a Scholars Development Programme during the duration of their scholarship which includes exposures to various departments within IACT College for enhanced working exposures, acting as an Ambassador of the College at various events and etc., in order to progress with their scholarship in the subsequent semester(s). 16. The decision(s) of IACT College shall be final and binding on all matters pertaining to the scholarship and award. 17. The terms and conditions of the scholarship and award may be modified and amended from time to time as deemed reasonable and appropriate by IACT College. 0 Komentar untuk "Creative Talent Awards 2017"